Even the most talented developer knows that a great website is time-consuming to build and a challenge to maintain. The reason: You need to meet graphic design requirements for every device according to current design trends, while ensuring that your website performance is optimized for any browser. 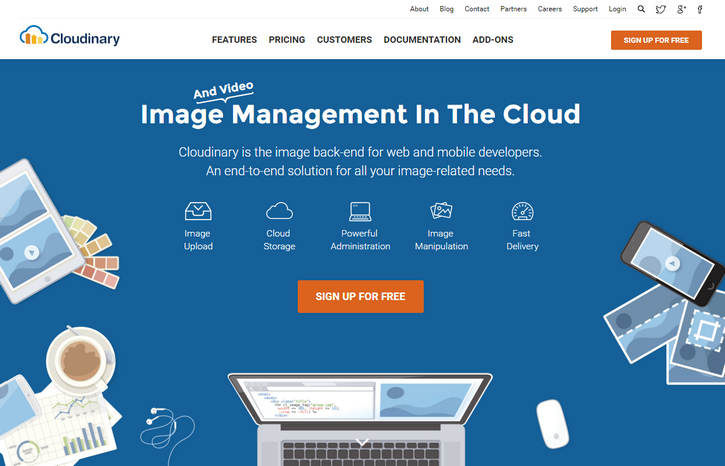 Cloudinary can eliminate many of the problems you experience when dealing with images. The cloud-based solution takes care of the entire image management pipeline, enabling image upload; providing a rich set of manipulation and optimization capabilities; and offering cloud storage, administration and super-fast CDN delivery. With our interactive demo, you can see Cloudinary in action as we walk you through examples of visual image manipulation and optimization, as well as some popular website implementations. In addition, you’ll ready-to-use code samples in Ruby on Rails, PHP, Node JS, Angular JS, jQuery and more. Resizing and cropping images on-the-fly to fit any layout – Cloudinary enables you to upload an image once, store it and then reuse it and instantly deliver it in any size and aspect ratio, to fit multiple device layouts and resolutions. This is done using a single URL with on-the-fly manipulation or a single line of code. This capability is even more powerful when you want to redesign your website, since no manual image work required. You only have to change that one line of code. Other than scaling to any size, Cloudinary enables intelligently cropping to maximize the visibility of important areas within the image, whether using automatic face detection or auto-detected areas of interest. Dynamically applying effects, adding watermarks and overlaying texts to fit any graphic design – Graphic design or other requirements usually involve more than resizing and cropping. With Cloudinary, you can apply effects, such as sharpening the image, artistic filters, colorization, and more. You also can add watermarks and text overlays, or create thumbnails based on automatic face detection, all on-the-fly using dynamic delivery URLs. Optimizing image size and website performance – Images typically account for the majority of a website’s bandwidth, and it’s important to take the necessary steps to optimize them. Cloudinary enables you to see how much bandwidth you could save by adjusting the compression quality or converting to different image formats. Cloudinary also can optimize the file size vs. the perceived visual quality by intelligently tuning encoding and compression settings and then selecting the appropriate image format based on the specific image’s content. Exploring popular website implementation examples – In the demo, you can see how Cloudinary can be used to easily create product galleries for e-commerce sites: browsing between different product images (or colors using thumbnails), and allowing users to zoom in on every detail. Other implementation examples include how Cloudinary is used to build and optimize responsive e-commerce sites, news/media sites, and social sites and apps. To test drive Cloudinary and learn how you can easily build a responsive website with user-uploaded images, visit the Demo. All features in the demo are available as part of our free plan.